Jim Brickman transports the Eastwood crowd to a "Beautiful World"
Jim Brickman’s latest album Beautiful World is about "friendship, healing and connecting cultures." He is set to tour 75 cities to promote his latest work. 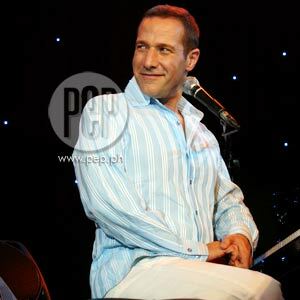 Pinoys fell in love again with Grammy-nominated songwriter and romantic piano sensation Jim Brickman during his two-hour live performance at the Eastwood Mall Open Park last Wednesday, October 28. And with the performances of international singer John Trones, local crooner Christian Bautista, and singer Gail Blanco, it’s like the audience was transported into a Beautiful World, which is the title of the pianist’s newly released album. Christian Bautista opened the show with "Never Far Away," the ASAP mainstay’s vocal addition to Jim Brickman’s latest musical collection featuring all-new material, written and composed by the celebrated pianist. Christian is the only Filipino featured in the new album. Moments later, Jim appreared clad in a striped, sky-blue polo shirt that complemented the romantic backdrop of flickering lights set against a hanging blue drape. In the middle of the stage, stood a black grand piano that, along with the elaborate stage design, seemed to dominate the starry midnight sky. Jim begun, "I am thrilled to be back in the Philippines. It’s been about five or six years since I’ve been here. I feel like it’s home every time I come here because I am welcomed so, so wonderfully by all of you. It means so much to me that you’re here tonight." The songwriter-pianist has visted the country for about "15 times," he added. MUSIC AND ROMANCE. Despite the technical difficulties caused by some piano keys failing to resonate properly, the concert went on rather fluidly. Jim, who has been playing the piano since he was five, started the night with an instrumental from Beautiful World called "Countryside." Next in his repertoire was the children’s classic, "Rainbow Connection," which he performed recently with Sesame Street’s Kermit the Frog. Jim pulled off a one-man performance for this song—he sang his part, imitated Kermit’s croaky voice, and also played the piano. He mentioned that his duet with the famous puppet recently happened in an event commemorating Jim Henson’s Muppets for a postage stamp ceremony. Jim’s little bit of trivia was about his stint in Sesame Street when he was eighteen years old, appearing with favorite puppets Kermit the Frog, Miss Piggy, Ernie and Bert, and other Jim Henson’s puppet creations. After the applauded performance, Jim rendered more songs from his album: "Free To Fly," an instrumental about "being able to go wherever you want to go, [and having] the freedom to be whoever you want to be," plus a song called "Simple Gifts" that Jim himself sang. He said the latter was written to remind everyone of the most important things in life. The native of Cleveland, Ohio also stressed the significance of romance in everyday life. "We need a little romance in our lives, and music can be a great backdrop," Jim told the crowd. "I just want you to invite me along to whatever romantic moment you’re having... just the three of us," he joked. It will also be interesting to note that Jim has never written about breakup or separation, and only prefers to write about the "hopeful things... positive things, great things, romantic things, idealistic things. That’s what I want my music to be about," he confessed. INSPIRED BY THE PHILIPPINES. After several songs, the night showed no sign of slowing down, still treading the romantic path. Jim’s longtime colleague and singer John Trones rendered his own song "To Hear You Say You Love Me," followed by some of the pianist’s more popular compositions, "Love of My Life" (with John Trones), "Destiny" (John Trones and Gail Blanco) and "The Gift" (Gail Blanco). Jim also performed two other instrumentals, which are among his absolute favorites: "Timeless," a song about "escape [and] letting your mind wander," and "Noche Pacifica," which was inspired by one of his visits to the Philippines. He also revealed that the song is "under consideration for a Grammy award this year." Translated to English as "Peaceful Night," this song brings to mind the night ambience of the Philippines, and was influenced by many of his travels to Manila, Cebu, Palawan, and several other tourist destinations in the country. "I got a chance to see what many other tourists don’t get to see when they come to Manila," said Jim, explaining that he had to include a song in his album that would evoke the night memories he had in the the country. The pianist added the he loves the Filipinos because they are always "so kind and generous and so enthusiastic about the music." Straying from the romantic tone for once in the concert, Jim played "If You Believe," an instrumental that he claimed to be his good luck charm, and two of his compositions—both of which will be used in the upcoming Vancouver Olympics—the instrumental "Hero’s Dream," as well as the song for the opening ceremony titled "One Dream," which was sang by John Trones for the Eastwood live performance that night. Jim was also very happy to share to everyone in the audience that the United States’ NASA (National Aeronautics and Space Administration) now plays his music to wake up the astronauts—hence, his music can be worthy of the term "universal" already. THE GIFT. Jim Brickman ended the night with the much-anticipated crowd favorite "Valentine," which was performed by Gail Blanco, and another rendition of "The Gift," this time in a duet featuring Gail and John. "I almost cried at my own song," joked Jim, after the Filipina and the international star finished their romantic duet. The pianist also said "salamat" to his Filipino fans. As expected, the audience clamored for more. For the encore performance, Jim rendered "Angel Eyes," an instrumental that came out 15 years ago, even before any of his more popular compositions hit the radios. Jim Brickman’s Beautiful World is a collection of the pianist’s own compositions that chronicle his many visits to different places, and the inspiration he gets from such travels. For Beautiful World, Jim will embark on a 75-city Beautiful World concert tour beginning this Fall. CLICK HERE to view photos taken during the concert.